Learn how to be more productive by focusing in what really matters (Video Edition). "What really separates the world’s top achiever and highly successful people is that they know how to manage their time better even though there’s only 24 hours in a day. 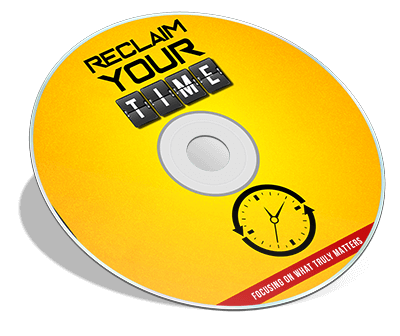 Reclaim Your Time is the ultimate video guide if you want to manage your time better, double your productivity, and get more things done so you can accomplish so much more than you could ever imagine. You will learn everything you need to know about time management, prioritization & productivity. How Productive Is Your Environment? Easy Tricks to Greater Time Management"
"Includes ready sales and marketing materials!